No matter how chic the décor or carefully planned the layout, a room is not complete without seating. For more traditional living and dining rooms, the heart of the design lies in comfortable but stylish upholstered chairs. Other spaces, like kitchens and mud rooms, gain a finishing touch with the addition of well-placed chair seating areas. 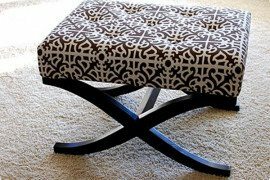 The chairs that play such a pivotal role in our lives can be taken to the next level with some beautiful DIY upholstery. Add a little attention to detail- the use of a stencil, some high-end fabric- and your ordinary chairs become works of art. So what do you think of these awesome projects? Do they inspire? Decorating in a small space can feel limiting, especially when it comes to furniture. 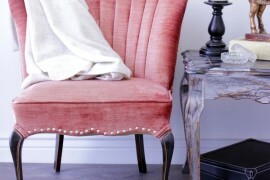 Jess of Jess Lively maximizes the impact of her living room with a beautifully upholstered armchair. 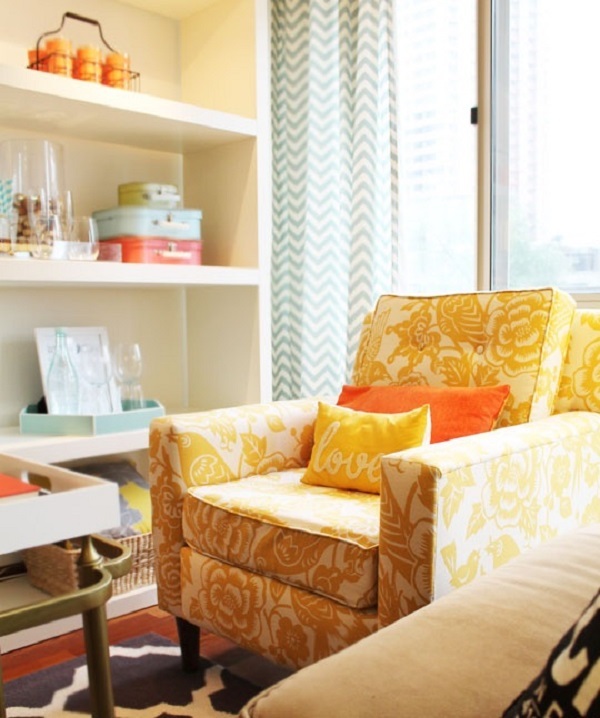 The bold floral print and cheery yellow color combine to make a perfect seating addition. See more details on Jess’s chair here. Trying to liven up a neutral palette? 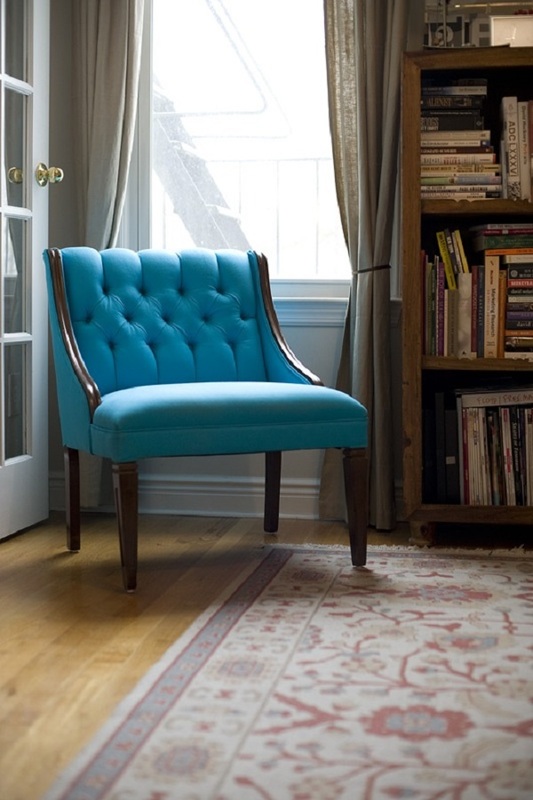 Use an armchair to infuse a pop of color in any room. Penny from Little Miss Penny Wenny uses a chic blue and white printed fabric to add some pattern to her predominantly taupe living room. 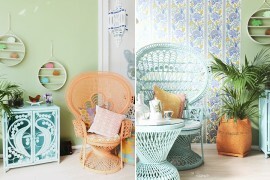 Small, soft patterns can often make as big an impact as large, bright ones. Deana of Alchemy Fine Living went the less-is-more approach when choosing this muted creme fabric with dainty pink roses. Tufting and plush padding make this armchair even more gorgeous. 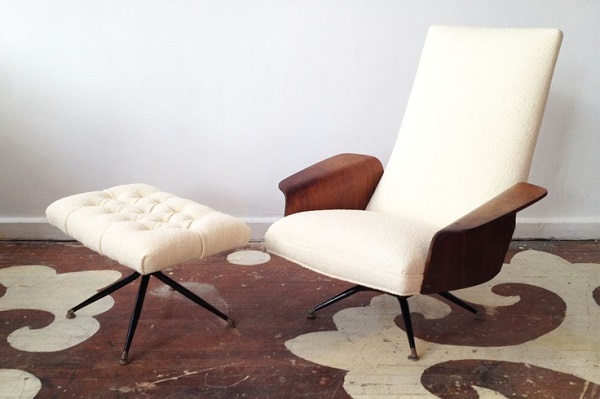 Clean lines and a rectangular shape are among the highlights of this mid-century vintage chair. 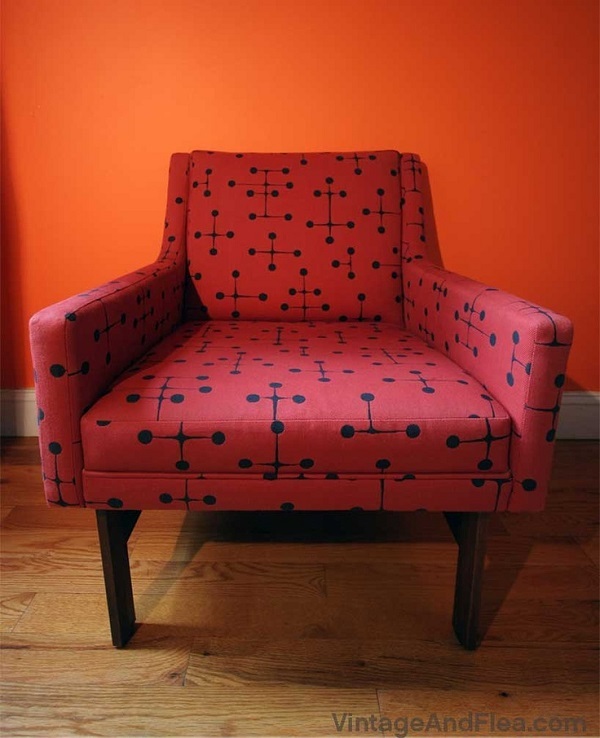 To keep the style consistent, DeDe and Jack of Vintage and Flea used a retro dot fabric for the upholstery. Sarah of Three Boys sure knows how to make a statement in her home! The bright patterned fabric paired against the weathered white paint strikes the right balance between fun and sophisticated. The double welting along the sides gives the chair a professional, tailored finish. 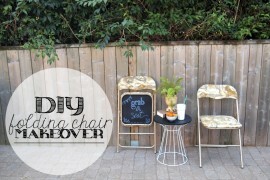 To see Sarah’s chair transformation, check out her tutorial. Niamh of Urban Threads and Jessica of Antique White collaborated to create this posh office beauty. 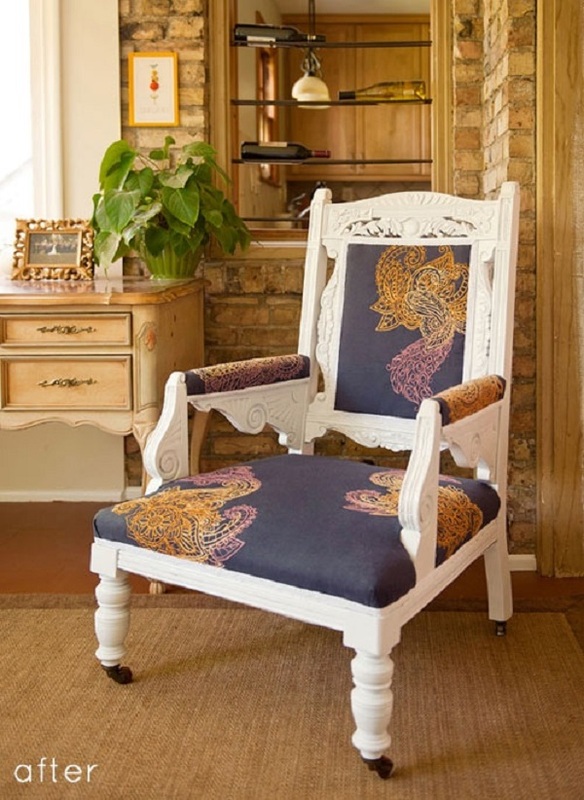 This thrifted chair features a custom embroidery design and mimics the carved curves of the wooden frame. White paint completes the look. Check out more information on the project here. Penny from Little Miss Penny Wenny envisioned a sophisticated addition to the corner of her master bedroom. The result of her DIY? 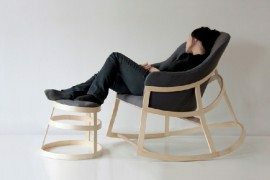 This chic armchair. 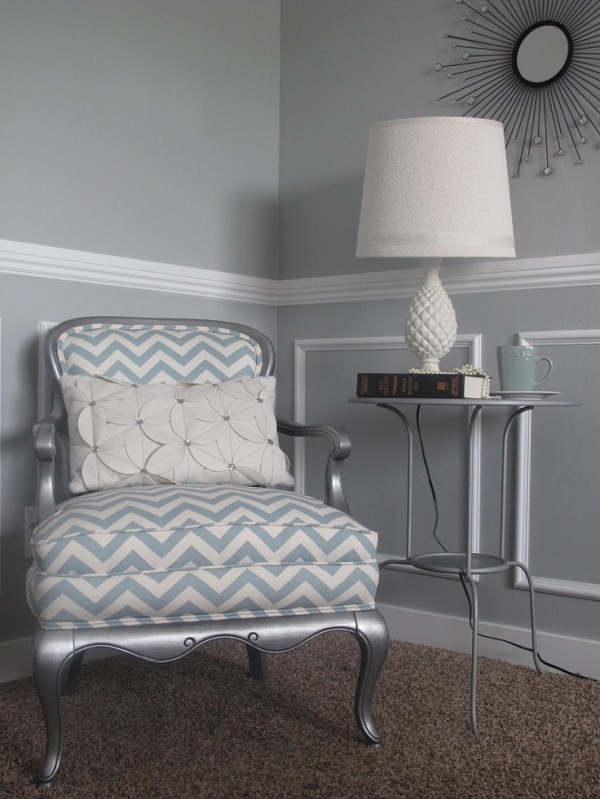 It features metallic silver paint and trendy chevron-patterned upholstery in a muted gray. 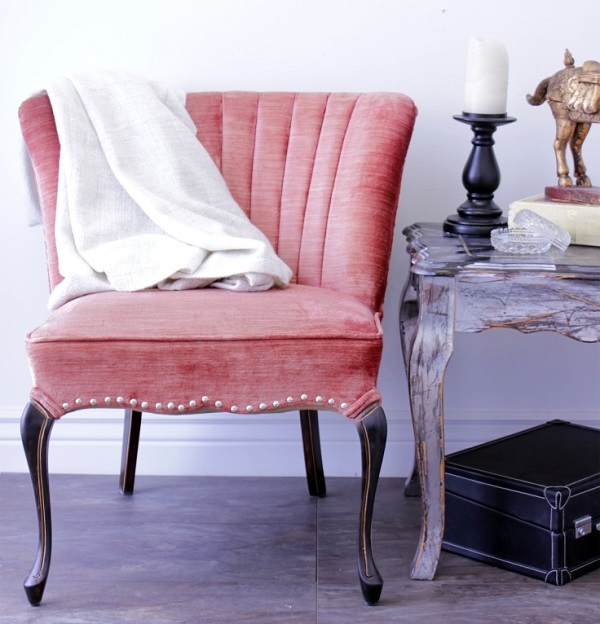 Customized by Kirstin of Kojo Designs, this thrift-turned-treasure exudes elegance and charm. Upholstered in an eye-catching sky blue hue, the real showstopper is the tufted backboard and slate gray nail heads. White paint makes the entire design really pop. Marc of Home Trends Magazine saw some potential in this flea market find. Inspired by a chair he saw at a design show years ago, he merged classic and modern design elements by featuring stud upholstery nails along the bottom and a stencil design on the back. 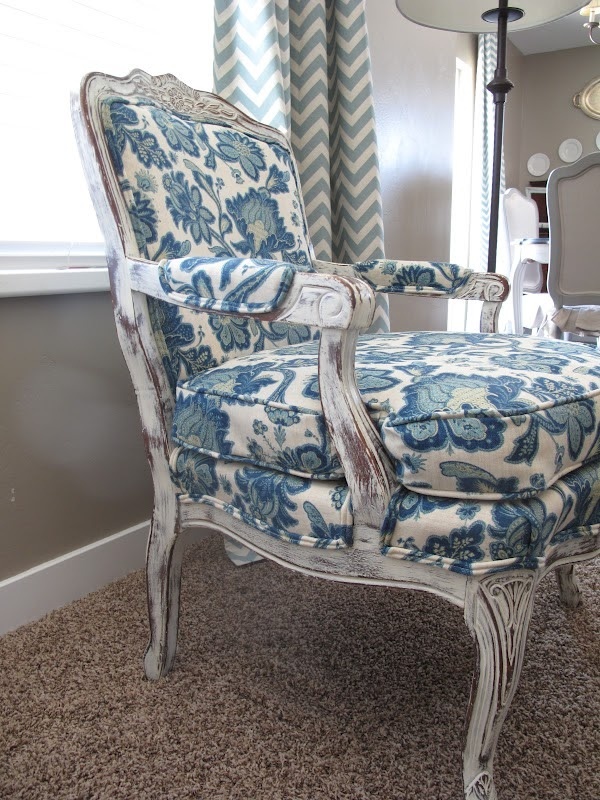 Featured by Jen of The Haystack Needle, this stunning armchair demonstrates how little details- a rich stain, a tufted back- can transform a basic piece into something spectacular. 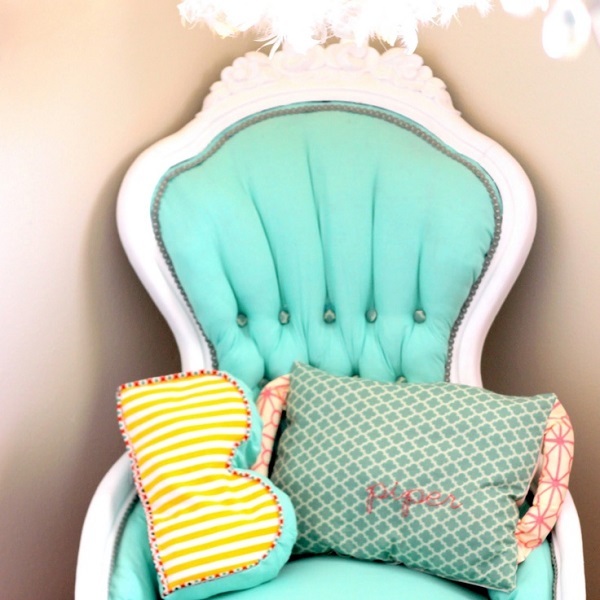 Vivid turquoise upholstery completes the look. 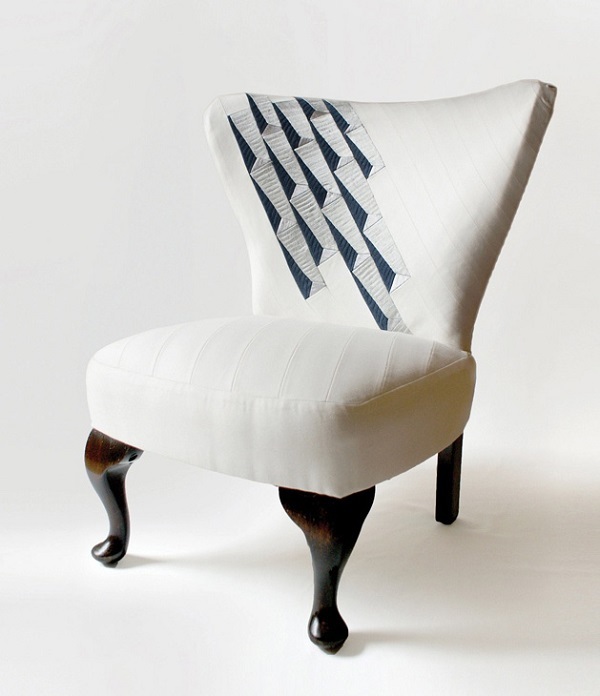 This one-of-a-kind chair takes upholstery to the next level with a patchwork and embroidery design. The simple silhouette and clean geometric shapes would blend in flawlessly in any modern home. Check out Make: Craft for more details. 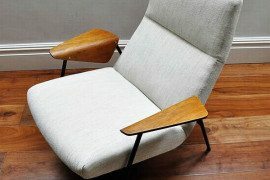 Duo Molly and Tracy of Chairloom transformed this mid-century lounge chair and ottoman set into classic statement pieces. The chair is upholstered in crème wool reminiscent of a cozy sweater. 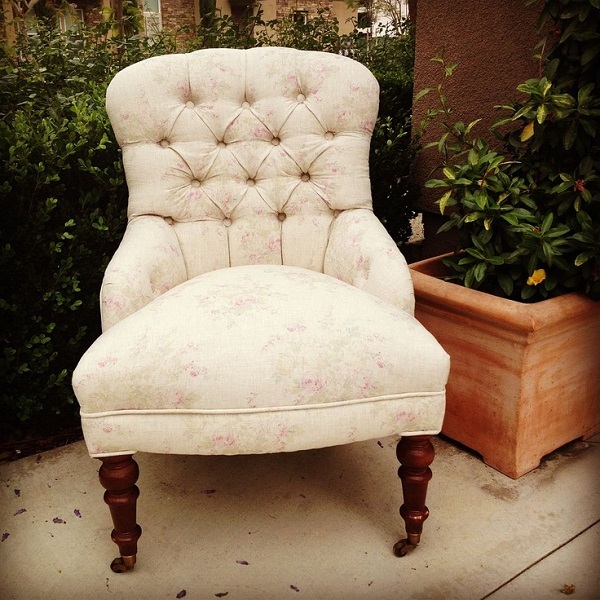 A spot to curl up in, a place to prop your feet… what more could you ask for in a chair? 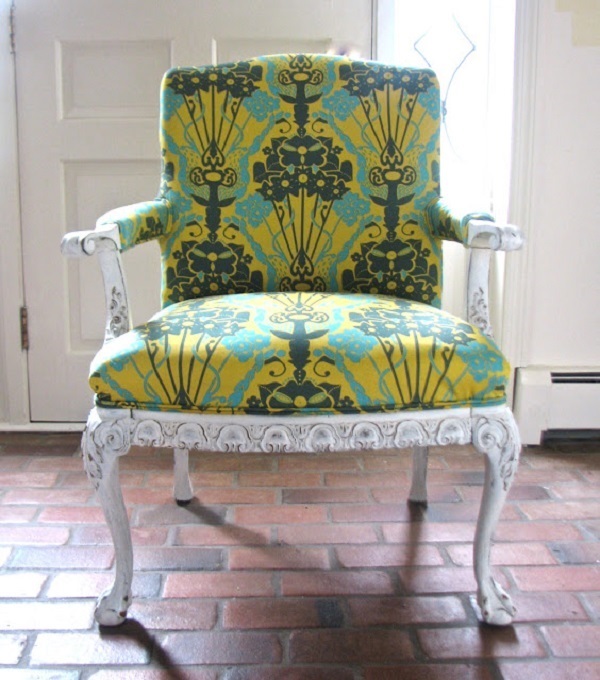 With a little patience and the perfect chair, you too can create your own custom upholstery. Endless fabric options, plus small details like paint and hardware, can make your seating a stunning addition to your home. Feeling inspired? Tell us so in a comment below.